Motorcycles are like fingerprints - you won't find the same one anywhere. There are so many different styles, types and brands and each points towards its owner's personal identity. This explains why we offer a vast selection of sportbike tires. We have individual front and rear tires as well as select tire combinations to fit your Cruiser, Dual Sport, Scooter or track day machine. When looking for a new set of motorcycle tires some basic questions must be answered. How long do you want the tires to last? Not all motorcycle tires come with the same tread wear. Unlike touring tires, don't expect to get much mileage out of racing tires. Buying sportbike tires is not a decision to take lightly. If you need help or have questions regarding the next tire for your motorcycle and riding needs, we are here to help you. We are The Guys That Ride so give us a call on our toll free line 866-677-7338 or check out our Sportbike and Motorcycle Tire Buying Guide. 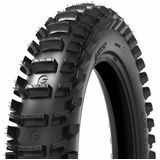 MotoSport stocks the tires you need to get riding and we make it easy to find the right size. 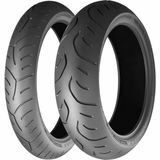 We feature one of the largest selections of motorcycle tires on the web and we'll get it to you fast so you never miss a ride.